Messi, left out of the starting lineup for only the second time this season when fit, was called on in the 64th minute with the game poised at 1-1 after ­Leganes forward Martin Braithwaite had canceled out Ousmane Dembele's first-half opener with a 57th-minute strike. The Argentine quickly provided the spark Barca needed by firing a venomous shot from outside the area which was too powerful for goalkeeper Ivan Cuellar to hold, and Luis Suarez pounced to stab home on the rebound in the 71st minute. 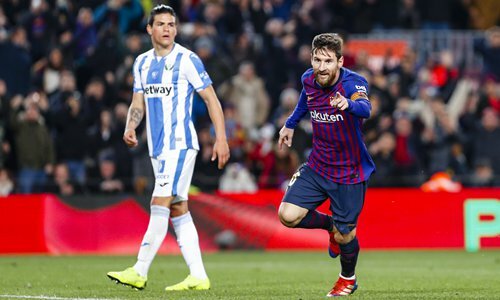 Messi made sure of the victory in stoppage time, sweeping across the area and hammering the ball past a helpless Cuellar for his 18th goal of the season in La Liga, taking leaders Barca on to 46 points, five clear of nearest challengers Atletico Madrid, after 20 games. "We played well. Leganes could do nothing in attack but we were just lacking precision in the final pass. They then scored out of nothing, but Leo came on and did what we know he can do," said Barca midfielder Sergio Busquets. There were worrying scenes for ­Barca when France forward Dembele was forced off injured midway through the second half after writhing on the floor in pain. The club later confirmed he had sprained his ankle. With Messi resting on the bench in the first half, Dembele was the team's focal point in attack, frequently finding holes in the Leganes defense with thrilling bursts of pace and wild dribbles. "Dembele has been in fantastic form recently after the controversy, he gives us speed, unpredictability and goals," added Busquets on the Frenchman's transformation. "He was unlucky with the injury, we hope it's nothing."